Home of the Cowboys, Oklahoma State University (OSU) is a dynamic university with a pioneer sensibility. With a student enrollment reaching near 26,000, OSU views new technologies as important tools to support pedagogy and enhance career preparedness. 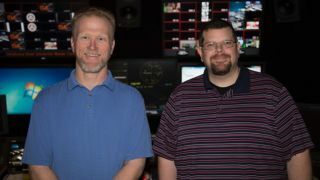 Rockford Todd and Jeff Huber are in charge of the AV systems at Oklahoma State University. They co-manage the AV department and directions that they take. While Huber is more focused on the day-to-day detail work (connections, terminations, and germane items), Todd is more focused on the big picture (functions, usability, and flow). This strategy has worked out to be a ideal management partnership that has propelled OSU’s department from being a decade behind technology to pushing the envelope with new, emerging technologies. AVT: Is your background in AV integration, or IT? Rockford Todd: My background is video production. I started in 1998 on the production side of things. Jeff's background is electrical engineering. He started here in 2000 as a master control operator, and then moved up the ranks. In 2005, I left here and became an integrator for a local AV company. After two years, I returned in a video engineering role. We became the managers of the engineering department two-and-a-half years ago. Rockford Todd: The line between the two is definitely blurred, if not gone altogether. It seems that every piece of AV gear you buy has some sort of networking component. It might be a web-based control page, or it might be a video stream of some type. It could be audio. It could be control that was previously done with RS-232, relays, contact closures, and more. We are even doing packetized video over IP now. On the flip side, it seems that most of the traditional IT devices are now doing AV. Desk phones are going to VoIP. You can do a video conference call from your cell phone, desk phone, laptop, tablet, and desktop. Once you get your head around the fact that you can do the same task no less than two dozen different ways, with many pros and cons of each way, you then have to begin to break down how you manage all of the traffic that is associated with the scale of devices that you are deploying, and may deploy in the future. To complicate this task, if you are in a situation such as ours, you must work with a different department to get space on the network. Alternatively, you (can) build your own network. It is becoming more and more challenging all the time because in our space, we have limited resources and work force to handle all the differing tasks associated with building and maintaining the "network" of devices that are sitting out there across the campus. Rockford Todd: Currently we are working on how to bring more than 160 classrooms across 10+ buildings on our main campus to an "online" state; how to get all those cameras, switchers, control processors, audio devices, wireless presentation devices, dsp, displays, projectors, screen controllers connected to the campus network without running an extraordinary amount of cable, but yet keeping it secure. Campus IT keeps their switches under lock and key. Only a few people have access, and I am sure for good reason. This process isn't done, but it is the most pressing problem at this time. Does the IoT (Internet of Things) have any influence in your organization and or facility? If so, what is your IoT strategy? Rockford Todd: This doesn't have a huge amount of influence in what we do. If your new sneakers can connect to the internet, that doesn't do much for us. So, we approach it on a case by case basis. Most recently, we have really gotten into wireless presentation. As the faculty becomes younger and more technology savvy, they want to use their personal devices to present in their classes. Most feel "trapped" behind the desk. So, this again goes back to how to get the wireless part of this to work. Do you go through existing network infrastructure, or create a new one for presentation? As more of the units come online, they then have to be managed for updates because devices are being updated all the time. How to you procure/purchase your AV for in-house installs? Distributor, manufacturer direct, in bulk, other? Rockford Todd: We will typically design, spec everything ourselves. Then, being a state school, we bid out the equipment. We typically don't hire out the install either. We are finding out that we are different than a lot of institutions like ours. Jeff and I have just determined that we have the knowledge and the ability to do this in-house. We have found that by doing it this way, we have more capital to spend on equipment. Rockford Todd: We are currently bidding out a LED video wall to use with our video production department. We are also looking to add health and operability software from Evertz called Vista Link Pro. This software should be a huge help in cutting down on trouble tickets, downtime, and general knowledge of how the systems across the campus are functioning. How does OSU manage your AV/IT capital budgets? How do you conduct needs-analysis for new technology; do you work within IT, AV, or a hybrid department? Rockford Todd: It is a complicated system, as you can imagine, when you talk about the vast range of services that you encounter on a campus such as this. For General Use classrooms and infrastructure, there is a student tech fee. The student tech fee is divided among all departments on campus. The division is allotted via committee and interview process. Therefore, our department gets an allotted amount based on what we are looking to do in the coming school year. We are not in the IT department; we are a standalone department that covers classroom technology, instructional development, and campus technology. Each college also has their own staff that take care of the needs of the individual colleges. They do, however, normally depend on the recommendations of our department as to the direction that they head. They are not required to use what we are using, but they check in and see what we do and what the next technologies might be. For instance, OSU was groundbreaking back in the late 1990s with online distance education. We were one of the first campuses to use H.323 codecs and "streaming" technologies. As it became more cost-effective, we helped steer the campus toward that platform as a "best use" for distance education and video teleconferences. Since that time, those processes have evolved. Now, we are moving on from 323 and moving towards a web-based solution for the campus. We are not pushing any one service, but asking departments to consider budgets and usefulness when upgrading teleconferencing rooms. The needs for new technology are based somewhat on personal preference, but also on what the instructional development group sees as important to new practices in the classroom. The flipped classroom model and group learning has really changed how we approach new teaching spaces as they come online. How do you decide what items are installed in-house vs hiring a third-party integrator? Rockford Todd: The decision is not based on a per item basis, but on project scale. For instance, we do most every install on campus in which we are involved. In 2009, Jeff and I along with our department did the entire broadcast facility remodel from analog to HD. This last fall, we designed and purchased the AV system for a new departmental building on campus. We hired that out for install because of the size of the project. We do not have the staff to devote to an entire building all at once. It was definitely interesting to let go of the reins and let someone else do it. All we did was oversee the project. Rockford Todd (left) and Jeff Huber (right), Engineering Managers, ITLE, Oklahoma State UniversityHow are deans and university presidents on the topic of new technology? Rockford Todd: Deans and presidents are all very different. Some are hands on, and others are hands off. Most of them want the technology. The biggest difference between them is how important is the technology vs. how much does it cost. There are certain parts of these types of systems that are a given. We all need/want a computer in a teaching space. We might like to have wireless presentation; this would get your slide show to display from your iPad or similar device. In this model, the instructor is not tied down to a teaching station. You might want to have two-way connectivity between student devices and the AV system in the room. This gives freedom for more collaboration. You might want digital signage in the lobby of your building. You might also want to have live/real time information streamed into displays around buildings on campus. All these things are possible, and common. The issue becomes how much cost is worth some of these conveniences. Our president is very supportive of new technology. Jeff and I are thankful for that, as are others like us on campus. The deans that we have worked with over the last two years have listened intently to what we are pushing forward on campus, and they understand that our goal in this role is to provide the university with the most functionality within a reasonable cost. We can normally deliver a little more because we do save money on integration. Jeff and I got a very nice compliment from a vendor recently. He bragged how we were able to accomplish in the new building that we just brought online in the fall, the same functionality as many other schools have with a budget of about half (again) as much. That can only be done by having a deep understanding of what you want to accomplish with your AV systems, and how each piece works together to make the system easy to operate, maintain, and repair. Rockford Todd: Where they are getting it wrong are (their) "all-in-one" boxes. I realize that many people are pressed for space, time, and money. However, in our experience, when you get those type of boxes they do not do anything well. It is by far easier to focus on one part of the equation and do it well, than to try to do it all and never really hit the mark. Do you see convergence as a real thing or just hype? Rockford Todd: Convergence is very real. As I said before, every piece of gear is just a small computer running in the background. It is not going to stop until it is one market. It ultimately makes AV systems easier to monitor and operate from remote locations. What are the higher ed stakeholders at OSU suggesting about the future of tech buying at your university? Rockford Todd: Historically, there has been a bit of a struggle to get new technology to campus. However, our current administration is very technology oriented. They encourage the use of technology in all aspects of campus life and learning. They are supportive when we approach them with new, innovative AV technology ideas. Budgets are always tight, and for the foreseeable future they will remain that way. Jeff and I work to be future-minded. If we purchase technology, we need it to be useful for the long term. It takes time to get the campus moving in any direction. It is sort of like turning the Titanic. Our responsibility is to develop a plan that is beneficial for the university's long-range plan. If we have to change directions every 3 or 4 years, then it is not beneficial. It is important for AV integrators, AV manufacturers, and other decision-makers on campuses around the country to know that we have to work together to bring technology onto campus in a way that is beneficial for everyone. Most of us that work on college campuses are deploying this equipment on a large scale. When you have such a large amount of infrastructure to put into place, a uniformity to maintain, and numerous people to work with/answer to, budgets are one of the highest concerns.